Aloe Vera can be called a Miracle plant with amazing benefits for health, hair and skin care. Aloe vera is know to be effective on acne, scars, fighting ageing and so much more. I have 3 Potted Aloe Vera plants and I use the fresh thick gel from leaf of these plants for many things which includes simple beauty hacks. If you are a girl loving natural remedies for radiant skin and healthy hair then you should definitely include Aloe vera gel in your beauty regime. Aloe vera has many beauty benefits and Egyptians called it the‘Plant of Immortality’ which amazing healing properties. This plant can be used for beauty in all seasons as well as women of all skin types including sensitive skin. I have been questioned a lot of times as to how exactly to use Aloe vera gel for face and hair and here I bring to you some very simple DIY ways to use freshly extracted aloe vera gel but first lets get to know what exactly is Aloe vera gel. The Clear thick pulp of Aloe Vera plant leaf is called Aloe Vera gel. This pulp can be converted into juice by putting it into a blender. Aloe vera is very hydrating and is the best natural moisturizer. Aloe vera isnt greasy so it is best suited for oily skinned beauties for a glowing soft supple skin. Even sensitive skin beauties can try aloe vera natural gel as moisturizer because of its soothing properties and it is also chemical free . Take some thick freshly harvested aloe vera gel and apply evenly on face like a mask , leave for 30 minutes and then rinse off. Laptop and mobileholics will easily get puffy eyes and dark circles which dnt go away easily. You can use fresh Aloe Vera gel to teat under eye bags for a bright and fresh look. Aloe vera can help repair dry and damaged hair and also reduce frizz to a great extent. You can also use Aloe gel to tame frizz and like a styling gel serum . Lightly massage raw aloe vera gel into your hair scalp and leave for about 30 minutes and rinse off to sooth itchy scalp and promote healthy hair growth. #5 Hair hold Serum: Aloe gel can also act like a natural way to keep hairstyles in place. #6 Brow gel: Dont invest in a brow gel if natural aloe vera works for you. Take little of aloe vera gel on your mascara wand and apply on brows to keep them in place. #7 Treat sunburns: Aloe vera is best way to treat sun burns, insect bites and scars. put some aloe vera gel in ice cube tray and freeze it to apply on burns and scars. #8 Cracked heel repair : Aloe vera works nicely like a foot cream for dry heels. Just apply a layer on feet and lock in with socks for super smooth feet next morning. When getting the gel from the plant you have to be very careful and take only the gel which is most beneficial in beauty. Here is how you should harvest Fresh Aloe Vera gel. Remove green skin part from top and bottom using the knife to reveal clear pure aloe vera gel . This gel can be blended in a blender for ease of use and transfer to a container. Make sure you immediately refrigerate the blended gel to get maximum benefits out of it. This gel if refrigerated can be used for 3-4 days but I recommend harvesting fresh gel as and when required and discarding the leftovers . If you are not the DIY kind or do not have access to an aloe vera plant then you can turn to store brought aloe vera gel or aloe vera based products. Most Aloe vera gels I have used have a green tint to it which means they are definitely not 100% pure because pure fresh aloe vera gel which is extracted from plant is transperent and colourless so I recommend you definitely consider getting an Aloe vera pot for your home. 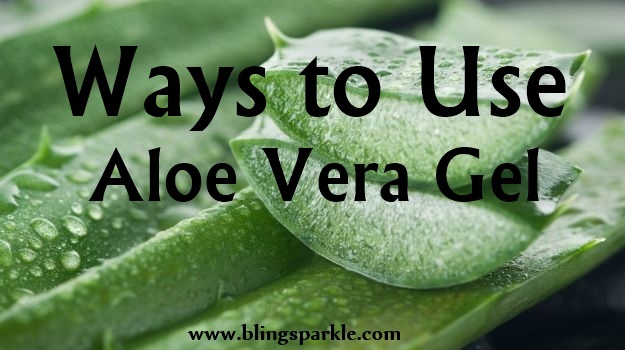 In what way do you use fresh Aloe vera gel? ST. D’VENCÉ Moisturiser Review ~ BEST moisturizer ever!